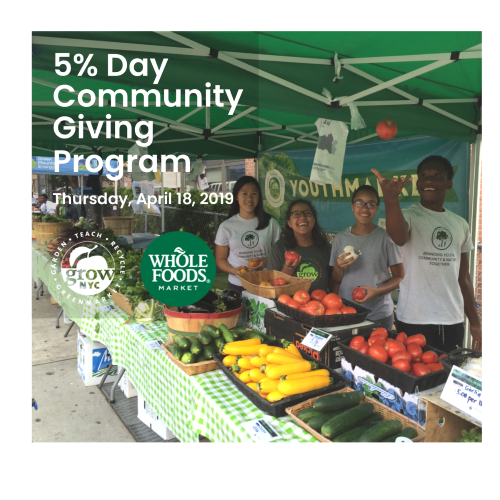 Market Hours: 9:00 a.m. - 2:30 p.m.
GrowNYC's Clothing Collection: 9:00 a.m. - 2:00 p.m.
GrowNYC's Food Scrap Composting: 9:00 a.m. - 1:00 p.m.
Upper Green Side Recycling Collection: 9:00 a.m. - 2 p.m. Batteries, Cords, Corks, CD/DVDs, Jewel Cases, Cellphones, and Cartridges accepted. Health Bucks are available year-round! EBT users -- for every $5 spent in EBT, customers receive a $2 Health Buck coupon to purchase additional fruits and vegetables. On Saturdays year-round, a dedicated following of shoppers flock to the 82nd Street Greenmarket which wraps from a sidewalk into a church courtyard on the Upper East Side. A full range of products including fruits, vegetables, baked goods, cheese, locally caught fish, chicken, goat meat and grass fed beef fill regular shoppers' bags week after week. Active community partners The Upper Greenside and St Stephen's Church contribute environmental and recycling information and activities, volunteers, and promotional support to help Greenmarket create a thriving market in this neighborhood. Community activities, cooking demonstrations and recipe exchanges will add to the diverse nature of this market.